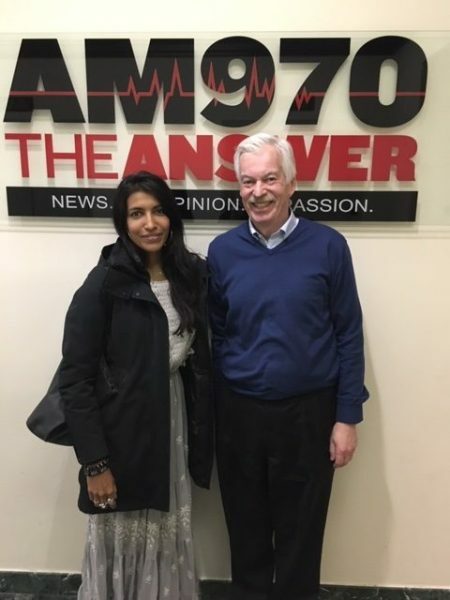 The following is a conversation between Leila Janah, founder and CEO of Samasource, and Denver Frederick, Host of The Business of Giving on AM 970 The Answer WNYM in New York City. Denver: For decades now, the preferred method to lift people up and out of global poverty has been international aid. But more and more people have come to realize that it’s not only ineffective, it actually is counterproductive. Direct cash transfers have had some success, but they too pale when compared to providing someone with a job at a living wage. No organization has been able to do that more creatively and energetically than has Samasource. 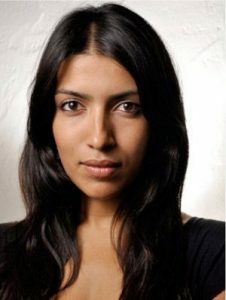 And it’s a great pleasure to have with us this evening, their founder and CEO, Leila Janah. Good evening, Leila, and welcome to The Business of Giving. Leila: Good evening. Thank you so much for having me, Denver. Denver: Tell us about the mission of Samasource, what the organization was created to do, and what the meaning of “sama” is. Leila: Sama means “equal” in Sanskrit, and Samasource fuels AI for humanity. We have a really interesting business model that involves recruiting and training people from very low-income backgrounds, primarily in East Africa and actually, the majority of whom are women, to do work in the AI supply chain for large companies and, in some cases, tech startups. The work that they do is in this really interesting space of training data. In order to automate a process like driving a car or recognizing a face, you need to teach the machine how to recognize patterns, and our workers are trained to annotate images and videos as part of that training data process. We have now created living wage jobs for over 10,000 workers in Kenya and Uganda, and what’s exciting is; when we say “living wage,” not only are we paying living wages, but we’re also recruiting people who came from very poor backgrounds. On average, we’ve improved people’s incomes by over 500%. We now have over 2,000 people working full time for Samasource from our offices in Nairobi and Kenya, Kampala and Uganda, and even a rural community in Northern Uganda, in the town of Gulu. I studied development economics because I was really passionate about addressing this problem of poverty, but I felt like so many of the aid models I’d seen were at best paternalistic, and at worst, straight up colonial. … there is so much talent in sub-Saharan Africa that really gets overlooked with the traditional aid model that views people as these passive recipients of aid, as opposed to producers. Denver: What’s particularly cool about that is, even after they leave Sama, about 95% of them maintain that living wage? Leila: It’s really hard to do. I studied development economics because I was really passionate about addressing this problem of poverty, but I felt like so many of the aid models I’d seen were at best paternalistic, and at worst, straight up colonial. They really reminded me of what my parents who grew up in India told me that they heard growing up, which is that there was this mentality on the part of the British colonialists that Indians were lazy and not going to amount to anything without colonialism. And that’s still something that they heard growing up in the ‘60s and ‘70s. My father said, “Now look back, and very famously, Bill Gates has said there would be no Microsoft if it were not for the India Institute of Technology.” Similarly, there is so much talent in sub-Saharan Africa that really gets overlooked with the traditional aid model that views people as these passive recipients of aid, as opposed to producers. There are essentially two root causes for, I’d say, over 90% of the problems we face in the world. They are climate change… and a lot of the things that we’re doing as humans that are contributing to that… and extreme poverty. If we address those two root problems, we can solve so many of the downstream effects of those problems. A lot of the health and education problems that we see are resulting in poverty. Even if you can provide free schooling in a country like Kenya, the opportunity cost for many families of having their kids go to school instead of working in the field is just too high. Denver: Let’s talk a little bit about global poverty. I know you have, as you’ve just said, studied that a lot, and you believe that a whole myriad of social problems can really trace their roots back to global poverty. What have you observed that has led you to that conclusion? Leila: I spent a lot of time living in poor communities and working in developing regions. What frustrates me is we’re so often attacking the symptoms and not the root causes of a problem. There are essentially two root causes for I’d say over 90% of the problems we face in the world. They are climate change… and a lot of the things that we’re doing as humans that are contributing to that… and extreme poverty. If we address those two root problems, we can solve so many of the downstream effects of those problems. Problems like in my field, maternal mortality; 99% of the deaths that occur each year – of women dying in childbirth, or around that same time – are due to poverty – 99%. That’s from the World Health Organization. So, we still have 300,000 women dying each year at childbirth, and almost all of those deaths are preventable, right? And the way we prevent them is by increasing the incomes – the household incomes – especially when we can do that directly with those women. If you can ensure that a poor woman moves into a living wage job, you can solve not only her risk of dying in childbirth, but so many other risks that she faces. A lot of the health and education problems that we see are resulting from poverty. Even if you can provide free schooling in a country like Kenya, the opportunity cost for many families of having their kids go to school instead of working in the field is just too high. You don’t solve the problem necessarily by building a school or by donating books to a library. You solve the problem by increasing the income of those families. And it seems so obvious: you want to solve poverty? Give people money. That seems obvious, right? But strangely, the aid world, because we’ve built up all of these large bureaucracies where people have incentives to do the opposite, to not think about job creation, we have a really bifurcated model, where business is seen as highly capitalist and profit maximizing, and all social good is supposed to happen in the nonprofit world or through the aid model, which is, I think, fundamentally often denying people their humanity. We have this very weird system, and I think most of the exciting things that are happening in poverty reduction and in climate action are happening in the middle, in the field of social enterprise. Denver: I think you’re absolutely right. I think in a lot of different fields, Leila, we need to redefine success. I had somebody in here talking about the homeless problem we have, and we look at success in the homeless arena is when the homeless shelters are a hundred percent full. We’re happy with the homeless shelters being a hundred percent full. And it’s like: no, no, no…that’s not curing homelessness, but that’s how you get rewarded! Everybody’s happy in City Hall! And it doesn’t make any sense, and you could go down the list and have a whole bunch of those. I had this typical American savior mentality that I’d go to this sub-Saharan African country and teach these poor children English. Of course I get there, and one of my kids was reading “Things Fall Apart” by Chinua Achebe, which was a great work of literature. My students could name US senators. They were listening to Voice of America and BBC Radio. I immediately realized that I had internalized this myth which is that: poor people are helpless and need saving. No one needs our saving. What people need is a level playing field to take advantage of the same opportunities that you or I would want. … I just became more and more frustrated because I saw so many organizations working to address poverty, but not fundamentally solving that core problem. Denver: As you went along this journey, one of the first early pivotal moments for you is when you won a scholarship from a tobacco company – of all things – when you were 17 years old, and you went to Ghana. Tell us about that. Leila: It was the most defining moment of my life probably. I grew up hearing about India from my parents. My mom grew up in Calcutta, which is both India’s intellectual capital, and also one of its poorest major cities. So, this dichotomy between talent… and having a population that’s extraordinarily talented, and also having very few job opportunities… was apparent when I was a kid. But I never experienced it firsthand. I grew up in the suburb of Los Angeles. My brother and I went to fantastic California public schools. We had every opportunity that so many young immigrants get when they come to America, which I’m so grateful for. But I had no idea what life was like living on a dollar, two dollars a day, and I got the chance to see that when I went to Ghana. Mostly this was fueled by a desire to have an adventure and leave home early. I was not having a good time at home with my parents. I found a way to graduate from high school early, and I convinced this scholarship committee to let me use the money to go and do volunteer work in Africa. And I had this typical American savior mentality that I’d go to this sub-Saharan African country and teach these poor children English. Of course I get there, and one of my kids was reading Things Fall Apart by Chinua Achebe, which was a great work of literature. My students could name US senators. They were listening to Voice of America and BBC Radio. I immediately realized that I had internalized this myth, which is that: poor people are helpless and need saving. No one needs our saving. What people need is a level playing field to take advantage of the same opportunities that you or I would want. That became really evident when I was in Ghana, and I just became more and more frustrated because I saw so many organizations working to address poverty, but not fundamentally solving that core problem. If we simply increase the incomes of the parents, especially the mothers of the children in my school, none of them would be facing the challenges that I saw. I saw kids who were blind for entirely preventable reasons. It breaks my heart… Kids who had cataracts, but they couldn’t afford the surgery. Just the things that in the year 2000, when I was there, should not have happened and should definitely not be happening in 2019. One of my clients was a large Indian outsourcing center that had a big workforce taking calls for companies like British Airways. I had met somebody in that center who was commuting in from Dharavi, which is South Asia’s largest slum– where “Slumdog Millionaire” was filmed. That lightbulb went off thinking: Here is somebody who wakes up in the slum every morning, in the same kind of slum where we’re running all these NGO programs, trying to help people get out of poverty. He hops on a rickshaw and a train and shows up in a state-of-the-art call center and is literally taking calls from a woman in Leeds about her British Airways ticket. Denver: There’s a lot of wonderful international organizations that do great work, but there’s also a lot that are writing their annual report and trying to say what they’re going to say to their board and their constituents; and that’s the driving force, not the people that they’re there supposedly trying to help. You graduated from Harvard. You went to work for a management consulting firm. But this little idea from Ghana was kicking around. So, on the side, after hours and on weekends, you began to start thinking about a social enterprise. How did that evolve and grow to what then became Samasource? Leila: Bless my bosses at my consulting job because they were so accommodating of my crazy ideas when I was a 22-year-old consultant. And actually one of them said, “You should go out and pursue this.” So, I received support from the firm to write my first business plan for Samasource, and then I ended up quitting months before I was to receive my second year bonus because I just couldn’t wait to get something started. I had read Thomas Friedman’s book, “The World is Flat” which was a big book that came around in 2005. I started connecting the dots between what I had observed in my consulting work. One of my clients was a large Indian outsourcing center that had a big workforce taking calls for companies like British Airways. I had met somebody in that center who was commuting in from Dharavi, which is South Asia’s largest slum– where “Slumdog Millionaire” was filmed. That lightbulb went off, thinking: Here is somebody who wakes up in the slum every morning, in the same kind of slum where we’re running all these NGO programs, trying to help people get out of poverty. He hops on a rickshaw and a train and shows up in a state-of-the-art call center and is literally taking calls from a woman in Leeds about her British Airways ticket. I connected the dots, and I thought – this same model which Tom Friedman is describing– which is creating lots of jobs, but mostly for middle income, educated people in big cities and places like India and the Philippines– that same model could be applied to address poverty very directly in a slum or in a rural area, if we could somehow figure out a way to break down the work. My first client was a social enterprise called Benetech, who you know… Jim Fruchterman, the founder of Benetech, basically took a chance on me, and I have to credit him. I would not be here; our company would not be here, had he not taken a chance, because everyone thought I was just Looney Tunes. I was going around Silicon Valley; I was pitching this concept on Sand Hill Road. Every VC turned me down and said, “It’s crazy enough you want to build this new business model; that you want to do it in Africa and only hiring low-income people…and paying them living wages? Why would we want to invest in that?” Most people said it was a crazy idea; it wouldn’t work. Most people on the foundation side said the same thing. They said, I kid you not, this is a direct quote. Someone told me, “Poor women in Africa need mosquito nets before they can use computers.” Just this outdated mentality… anyone can use a computer, especially low-income people who are under pressure to access government services and to do their banking transactions. They don’t have the luxury of getting in an Uber and going to a bank branch. They need to do it here and now. I actually saw the opposite – that there is much more ready technology adoption, especially mobile adoption, in Africa. So, that’s how the business started, those humble beginnings. Over time, we started growing the types of work we could do. Originally, we started doing data entry. We moved up into image imitation and all this AI stuff. Now we are one of the leading training data providers in the world. We have ISO-certified facilities, biometrics scanning when you walk in. It really looks like a state-of-the-art technology center, and I think it’s a real point of pride for East Africa to have this scale of an operation in Kenya. Denver: I think it’s referred to as impact sourcing. Would that be correct? …And we hear so much about impact investing, but not very much about impact sourcing, and it really is every bit as important. Leila: Absolutely. We actually have been partners…We were, I think, the first grantee of the Rockefeller Foundation working in this category. That inspired what has now become a movement around impact sourcing. There’s now an impact sourcing standards body, and there is a bunch of us working together. It’s been really exciting to be a pioneer in that movement and collaborate on the language around it. I like to call it “give work” because it’s quite simple. But the concept of impact sourcing is that rather than think at the corporate level, rather than think about achieving social impact through your foundation or your CSR program, you should think about achieving impact in the area where you have the most budget to tackle it, which is in procurement. So, the biggest 2,000 companies in the world spend $12 trillion on goods and services, sourcing everything from, unfortunately, the lithium which is often unethically mined, that’s in our phones, to the rugs in the conference rooms, and everything in between. If we were to direct just one percent of that global sourcing dollar spend on vendors like Samasource that actively hire low-income people and pay them living wages and treat them well, with basic, decent, good working standards, we could address poverty and so many of those downstream effects without actually spending more money, without having to set up big nonprofit bureaucracies to solve the problem. Again, it sounds so obvious. Why don’t companies do this? Most of the time companies don’t do it because there aren’t often easy-to-find ethical suppliers in many categories, which is the single biggest opportunity for anyone listening to this who wants to be a social entrepreneur: Go build an ethical factory. I just talked to the head of Social Impact at Kate Spade this morning. They collaborated and they invested in a Rwandan-owned factory that manufactures tens of thousands of handbags in Rwanda; 93% of their employees are women. That is such a phenomenal give-work model. Imagine if every brand did that. Imagine if we could take that Rwandan factory concept and scale it up much bigger. So, that’s where we can have the most dramatic impact, and I guarantee you, if you go and do a study on the long-term impact of those wages paid to those women in Rwanda or… we’ve done lots of long-term studies on our 2000 agents in Kenya and Uganda… You will see that that money has instead of a trickle-down effect, a trickle-up effect, because these people are then spending that money in poor communities. They’re funding the local baker, the local shoemaker. They’re building a more productive and prosperous economy from the ground up, but for low-income people. Women reinvest 90% of their paychecks in the health and education of their own families and the community. It’s the single best investment, and it’s better than any aid program that some scholar at Columbia or Harvard could ever design. Denver: A lot of people think you’re helping a woman, or you’re helping a family, but you’re really helping the entire community. It just cascades and keeps on cascading. Leila: Women reinvest 90% of their paychecks in the health and education of their own families and the community. It’s the single best investment, and it’s better than any aid program that some scholar at Columbia or Harvard could ever design. Denver: Afraid to say: men are about 40%. None of this would work though unless you were able take all these workers and these huge projects of the companies that you just talked about, and somehow to break them down into something called microwork, which you do through SamaHub. Tell us about that platform and how this all works. Leila: It started with using off-the-shelf software. I used to use a platform called Basecamp, and I would personally manage these projects. I was personally doing the QA on the work for Benetech, which was transcribing PDFs into text files. We evolved from that into now handling massive data sets. For Microsoft, we have annotated millions and millions of images now. We were the primary training data provider for one of their big gaming devices. That took very different infrastructures. As soon as I could, I started hiring engineers. I think my first engineering hire was back in 2009. We slowly built up what is now our core software platform called the SamaHub. The SamaHub allows us to pull data from a client’s data sets into a system where we can then parse it out to different workers, and we can manage the workflow and manage the quality through our own platform. Over time, we’re getting into a lot more automation of the work. For example now, when you’re annotating an image from a car camera, you might be seeing a picture of a road with lane lines, vehicles on it; we can now auto-detect the edges of the cars and the image for example. We’re now handling 3-D data. Some of the data that’s used to develop the maps in your phones or to develop the sensors on your car that are telling you to stop when you need to stop, or are automatically stopping the car for you before you hit a pedestrian. Those sensors are being trained with data from LIDAR systems. LIDAR data looks like gobbledygook if you see it on the screen, but we’ve trained our agents to make sense of these images and to identify in the 3D rendering where a car might be in that rendering. That’s what the SamaHub essentially allows us to do. It’s basically allowing us to manage these highly complex, scaled workflows across a large number of people in different time zones and different geographies, and then also to manage the QA. Where we really excel – now we’ve seen a lot of competition; there are crowdsourcing firms entering our space, but we pride ourselves on scale, on quality, and on security. A lot of the data we’re seeing is not something that you would want someone annotating from an internet café or their bedrooms somewhere. You want to make sure that the data is secure, especially if you’re handling data for facial recognition, algorithms that might come from user data. You really have to treat that very sensitively, and we have our own facilities, with a lot of infrastructure around them to support that, and I think that’s the future of the data training industry. I think there’s so many more jobs that could be created building training data to teach machines to do stuff. We’re just at the beginning of this new economy. Denver: There are no jobs, of course, unless you have these corporate partners that you’ve been able to enlist. We talked about Google and Microsoft; there’s eBay, and LinkedIn and Walmart. Was it easier or harder than you thought to get them on board? Leila: It took a while. When you work with a large enterprise, you have to be able to scale, and the challenge as a young start up is typically that the scale of these operations dwarf anything you have. You can easily get obliterated by a client request or fail really quickly, as has happened to me before with my other business, with LXMI. We started small and we grew. I think organic growth…it’s not really encouraged in Silicon Valley, but I think it’s the healthiest way to build a business… is not to pour too much gas on the fire before you have a there, there; before you know you can handle it. We started small. I think our first pilot, after I talked to 60 different people at Google, I finally got Google to give us a tiny pilot. That’s grown into a relationship that’s lasted now more than five years. The same with Microsoft. We always start small with a pilot. We prove ourselves. We show that we know what we’re doing. And then we often have very long-term relationships with our customers as a result. We found that if we just educate people on the basics of how the gig economy works– how to set up a profile, on these different sites? How to choose a photo that looks professional? How to use the right key words when you’re marketing yourself? This is something that might not occur to you if you had a factory job for 20 years, and all of a sudden became unemployed. Or if you were a truck driver for many years, and truck drivers are going to see huge shift in their industry. We know that this is getting automated. It’s coming. We have a moral duty to make sure that people land on their feet. One of the aspects is making sure our job training systems in this country are modernized. And it’s currently an abomination. We’re teaching people to do jobs that have gone away or are going away really rapidly, and we are not teaching them about the one sector that’s growing the most. Denver: A lot of people think that Samasource as working strictly in the international community, but you also have programs here in the United States through something called Samaschool. What is that about? How does that work? Leila: I’m so happy you asked about this because I get accused all the time of just focusing on Africa. Why don’t I care about America? I care a lot about my own country, and had been trying, even before I started Samasource, to think about ways to address domestic poverty. The problem that US workers face is actually quite different than the problem that a lot of developing countries face, which is that here, work has shifted into the gig economy in a really massive way. 90+ % of job creation in the last decade has happened in the freelance or gig economy. Just think about that. The Bureau of Labor Statistics just last year released the first ever report we’ve ever done on this sector. Meanwhile, a third of Americans are freelancers now. It’s really shocking. It was a battle for us to initially get Samasource started because we had this idea, after looking at the data, we said: Could we start a version of Samasource here in the US? And we looked at the data and said: Actually, it probably wouldn’t be successful. What would be successful here is if we could figure out a way to equip low-income people with the skills to succeed in the gig economy, by which we mean to earn a living wage and to avoid getting scammed. We saw the potential that was in a lot of these crowdsourced-type systems or these gig platforms. We saw the potential for low-income people to benefit, but we also saw a lot of risks. So, we said, let’s be proactive. Let’s try to find ways that we can help people navigate this new world as workers, especially people who’ve been long-term unemployed, who are below the poverty line. We focused on demographics that really need the support, and we found after a quick pilot back in 2012, we found some amazing results. We found that if we just educate people on the basics of how the gig economy works- how to set up a profile on these different sites? How to choose a photo that looks professional? How to use the right key words when you’re marketing yourself? This is something that might not occur to you if you had a factory job for 20 years, and all of a sudden became unemployed. Or if you were a truck driver for many years, and truck drivers are going to see huge shift in their industry. We know that this is getting automated. It’s coming. We have a moral duty to make sure that people land on their feet. One of the aspects of that is making sure our job training systems in this country are modernized. And it’s currently an abomination. We’re teaching people to do jobs that have gone away or are going away really rapidly, and we are not teaching them about the one sector that’s growing the most. I understand there’s government skepticism. I don’t think that to teach people about the gig economy means that you buy into everything that these platforms are doing. I think you can be a force for good and for positive change if you work with those platforms, and if you design the training that’s really targeting the needs of workers. Since we launched Samaschool, which is a short boot camp; it’s an 8-to 10-hour boot camp. We deliver it through local nonprofit partners, through the City Workforce Development Programs in San Francisco and New York. We’re actually rolling out with CUNY here in New York and with the California Community College System. It’s my hope maybe someone listening, works at the New York Public Library systems; but we could roll this out in every public space that has computers in this country. Imagine if your local library allowed you to access this training for free, and you could come in and learn in 8 to 10 hours how to quickly start earning money through the freelance economy, avoid the scams. There’s lots of other skills you need like: How to manage your taxes as a freelancer, which are totally different than if you have a traditional job; how to think about benefits. At the same time that we’re doing this, we’re also advocating for better treatment for freelance workers. We came out with a series of white papers last year. This will shock you, but did you know that anti-discrimination protection for workers does not apply to freelancers? Isn’t that crazy? It’s unbelievable. Most Americans – I would venture to guess that they don’t know that. Because you think, you’re not allowed to tell someone they’re not getting hired because they’re gay or they’re black, but you can absolutely do that with a freelancer, and it’s legal. That seems like a very practical thing that we could solve that most people would agree is not okay. These are the sorts of recommendations that we focus on. What are pragmatic solutions that most of us can agree on that we should adopt in this sector, that the companies that are creating these platforms should manage? And/or maybe there’s the potential for individuals to file suit if they’re discriminated against. Denver: So many people don’t have the mindset to be a freelancer, which is a big piece of it. You have to have a little bit of resilience and understand there’s going to be the ups and downs. You’re absolutely right about the soft skills, and I know a few people who’ve been working on a job for a long time, have been laid off or whatever… it’s like they’re going into a different world. They don’t even know what they’re looking fo…, monster.com or something—things that have been bygone. We talked a little bit about before the inefficiencies and the frustrations about the nonprofit sector, so much so, that you’ve become a self-sustainable organization. Talk a little bit more about that and where you see the shortcomings in the sector in terms of how we try to solve problems. Leila: In the last few decades, as the wealth gap has grown in the United States, I think more and more people are now aware of this…with AOC and a lot of the young, progressive members of Congress calling attention to this massive wealth inequality but we live in a society that’s as unequal as the US was in the 1920s in the age of Robber Barons, which is absurd. When you have that big a wealth gap, you see these instances where basic services are reliant on donations from highly wealthy individuals to sustain themselves. I think that shouldn’t be the case. You can’t rely on the whims of rich people to provide basic services, and I think that’s the biggest problem with the traditional charity model, is basically, things are donor-driven. If you are accountable… if your source of funding is coming from a wealthy individual, that person might change their mind after a couple of years. They might move in a different direction. The nonprofit world has plenty of fads, just like any other industry, and we’ve seen…I’ve seen firsthand in Africa the impact of that. If some rich person changes their mind, all of a sudden you might have thousands of people who can no longer access a critical service that they’ve come to depend on. I think that whole system is deeply unhealthy. We can resolve that in a few ways. One is by reforming the tax system, which many people are doing, I think, and having important dialogues around. The other way is you can reform the nonprofit sector itself, and one of the things I try to encourage nonprofits to do is to think about building social enterprise models, give-work models. There’s no reason if you’re trying to fight poverty that you shouldn’t be thinking about jobs. You absolutely should be. There are so many more exciting opportunities for social entrepreneurship here in America. Think about everything from bakeries – I know several social enterprise bakeries… to restaurants. If I’m choosing where to go to dinner, or where to take my fiancée for date night, I would love the chance to choose a restaurant that also provides jobs to low-income people… we have so many great examples. A friend of mine runs Old School Café which is a soul food kitchen in the Bay Area that employs formerly incarcerated youth. She used to be a corrections officer. You get so much more bang for your restaurant buck if you shop that way. This concept is really alive and well in many other countries. I think it’s less developed in the US because we don’t have a lot of infrastructure around it, and there frankly are very few benefits for organizations that do this. Frankly, I think if you set up a social enterprise model that’s directly giving work to a population that might otherwise have to receive government benefits, you should get a tax credit for doing that. Or maybe there should be some government wage subsidy for the people that you’re transitioning into the workforce. That happens in some cities at a city level, but it’s nowhere near the national ambitious plan that it should be. Denver: There are so many things in the sector that are siloed. A perfect example of that would be foundations, where 5% of their money goes to grants, and the other 95% can go to investments in petroleum or tobacco companies for all they care, as long as it gives them returns. So, you’re beginning to finally see … My concern, a little bit about the rich giving a lot of money– which is a little bit different– is that it’s really masking a big decline in the sector, because the number of people giving to charity are way down. When this economy pops a little bit, and goes down, these big gifts– which have made everybody feel somewhat complacent at $400 billion– it’s going to be a tremendous hit on organizations. Exactly to your point… they become too dependent on those gifts. I know you think the answer is somewhere in the middle, that it’s not with nonprofits, it’s not for-business; it’s right there in that sweet middle. One of the organizations that you started that’s in that middle is LXMI. Tell us about that. Leila: This is hopefully the last new company I’ll start in a really long time because it’s impossible to do… Many other stakeholders would agree. I started LXMI because I was going back and forth to Uganda for Samasource. I love when I go to Africa; when I go anywhere, I love shopping in local markets. Even here at the farmers market in New York City. It gives me so much joy to meet the creators of the products I’m buying, to hear their stories. I think everyone enjoys that kind of commerce more. I always go to these local markets. In Northern Uganda, I came across in a local market this amazing skin cream called Nilotica. I thought it was some local formula. But as I did more research, I learned that it was a single ingredient. It’s a rare, heirloom varietal of East African Shea butter. Nilotica is a different subspecies, but we’re very basic about how we label plants. Unfortunately, most people think it’s just Shea butter; it’s just like any other Shea butter. But just like all red wine comes from red grapes– you can have a $3,000 bottle of very fancy stuff, and you can have a bottle of two-buck chuck, all made from red grapes. But there’s a significant difference depending on how the grapes were grown, where they’re grown, the whole process. I thought there was such an exciting opportunity to bring light to some of these amazing natural ingredients, which, by the way. are almost always especially in sub-Saharan Africa, harvested by women. …That could provide living wages to women doing the harvesting, and that could provide a powerful incentive to conserve the wildlife, to conserve the wilderness areas that these plants grow in. Right now, one of the biggest factors in climate change is, we’re cutting down tropical rainforests at an incredible rate. The reason we’re doing that is that people need to eat, and they need to live, and the communities around those forests are often doing the cutting down because they need to graze cattle, so they can send their kids to school. They need the land. If you can show them that they can actually make more money by sustainably harvesting products from the forest, then you have the financial incentive to keep that land wild. A lot of the biggest conservation organizations are now looking at these things called conservation incentives which provide exactly that. Rather than work with the government to say, “Okay you people living by this forest, you’re not allowed to use the forest for anything, and we’re going to make it a national park.” Instead, is there a way that you can create a revenue stream for that population using sustainably resources from the forest? And the sustainable part is key. You obviously can’t have a model where you’re stealing everything from the forest and destroying the very plants that you need to keep alive for the model to continue. But there’s some really exciting examples of this and production of many ingredients from South America, from the Amazon. There’s amazing models with companies that are selling everything from cheese to spices. So, I thought that same model can work in skin care. I said, Let me see if I could get Nilotica on a luxury beauty counter alongside these skin creams which I had previously been buying… That are full of toxic chemicals and petroleum and stuff that is banned in other countries… that’s allowed in the US because we haven’t regulated the stuff in decades, because the people who are regulating it are paid by the industries that are producing it. There is so much opportunity, I think, in this exciting new natural sector. Consumers want it. There’s a hunger for plant-based remedies, in food and health and wellness and especially in skin care. And I thought there was real opportunity to create a luxury brand around this concept. So, I launched LXMI, which is derived from the goddess Lakshmi, goddess of beauty and prosperity in Hindu culture. LXMI stands for beauty for humanity. We source rare botanicals in partnership with local communities that have a fair-trade model and an organic sourcing model. We retail our products at really amazing partners like Sephora, and we also sell a lot now online on our website. Denver: Leila, there are very few organizations that score 4 or above on Glassdoor, the ratings that are given by employees. But Samasource would be one of those. What makes your corporate culture so exceptional? Do you think about it a lot? What are some of the things you do to shape and influence it? Leila: I wish I could say it was me and my brilliant ideas, but actually I think the reason our score is so high is that I’ve recognized where I’m really not great and hired people who are much better than me at managing people. I would say that as you grow as a company, it’s really hard for founders to do this but, you have to recruit people who are excellent operators and managers who know how to manage large teams and scale them. Given that this was basically my second job out of college – I didn’t have that knowledge myself. I’m really lucky I have an amazing COO, who I think has a very high EQ and understands how to navigate a bigger organization to get things done. It’s really in combination with people like her. We have an amazing management team that also is composed of seasoned managers who bring in with them a lot of strategies for keeping people happy and motivated. I think the one thing I could take some credit for is the underlying social mission in what we do. There’s a lot of evidence that shows that people don’t just show up to jobs for money, and those that do, and the kind of corporate cultures that are solely using financial incentives to reward people, tend to be less exciting and less motivating than those that have a shared mission. I really believe that if you can align your values as a human being with the way you spend the majority of your time at work, you’re just a happier person. When you have a fight about something, I know that when I’m fighting with someone on my management team that that person cares as much about the mission as I do, and that we’re both fighting for something much bigger and much more noble than this issue at hand. When you have that underlying culture, you, in my view, have people who are happier and more independently motivated. They’re not working for the man. They are not just working to make me or my COO richer. They’re working for a much bigger concept– this concept of giving work. They know that it’s not just our workers who are benefiting. But it’s the entire community of people who are watching Samasource and realizing: Wow, this can actually be done! When we started, people laughed us out of the room. Now we’ve shown that not only can this be done, not only can it be done in Africa, but it can be done in Africa with a population of people who nobody really believed could do AI training data before. That concept is so powerful, knowing that we’re a role model for other companies, and illustrating that in this industry that we’re in, that’s increasingly being populated by crowdsourcing companies, and companies that maybe don’t have the same approach to labor standards as we do, it’s exciting to feel like we’re leading the good fight. Denver: What’s also exciting is that when you look around and you see people who work there, actually care more about the organization than you do… or at least as much… I think that is the dream of every founder… that they have it that deep in their bones. Leila: I really do, and I am grateful every second of every day that I have that because it means the burden is shared, and I really feel like it’s super hard on a startup to recruit people who you feel, as a founder, own it more than you do. We’re now at that point with both Sama and LXMI. Denver: When the burden gets a little too heavy, you turn to nature. Forest bathing, as the Japanese would say. What does turning to the wilderness do for you? Leila: I read that a doctor in Scandinavia was starting to prescribe this to patients. If only pharmaceutical industry incentives worked that way in the US; that is exactly what we should be doing. There’s so much scientific evidence that shows that we are happier beings if we spend time in wilderness. Not just the park, not a manicured garden, but real wilderness! For me, having grown up right on the Pacific Ocean in Southern California, which I feel like is the promised land, for me spending time in the ocean every week is critical. It’s as critical to some people as eating or sleeping. I’m really lucky that I’ve had the chance to live by the ocean. I kitesurf regularly, and I’m just getting into surfing now. I actually went kite surfing here in Long Island at Gilgo Beach, which was awesome. To me, that’s that connection. It’s using a kite, which is only wind powered, and a board and exploring different parts of the ocean, and getting to see turtles and dolphins. I’ve never seen a shark before. It keeps me alive. The other nice thing about more extreme sports is that if you’re an entrepreneur who’s constantly worrying about work and various issues coming up with the business, if you’re not 100% focused when kiting… on not dying, not getting dragged across the beach, that’s going to happen to you. So, you have to have that focus on the present moment, which is so hard to do as an entrepreneur. 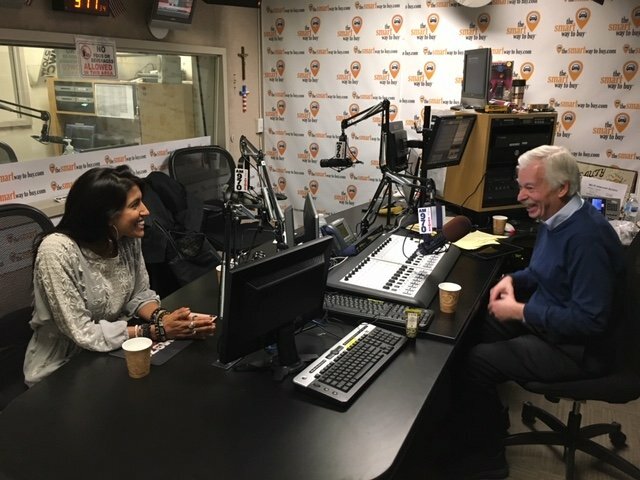 Really at no other time in my life… I can think of one other thing, but I won’t mention that on the radio; basically very few activities force you to be in the present. Kiting does that for me. Denver: Let me close with this Leila. The history and trajectory of Samasource tells me there’s always something around the next curve. Notwithstanding what you said, no more ideas, no more new ventures… tell me what you’re currently thinking about. And what do you think is next for the organization in the next five years? Leila: I think there’s going to be a huge opportunity in training data. I think this idea that machines are stealing all of our jobs is very shortsighted, and there is a tremendous number of jobs coming in fields like training machines to do things, like training data. Also, in totally non-automated fields like care. There is such a huge opportunity right now in high quality elder care and childcare all over the world where the population is booming. It’s going to be a long time before we have a machine– or before we want a machine– doing that kind of work. I’m super excited about proposals like the Green New Deal here in the US, which propose government incentives to employ people in potentially some of these areas. Imagine if we had government incentives for people to set up neighborhood childcare centers in their neighborhood. My neighborhood has one in San Francisco. There’s a woman on my block who watches the kids in the neighborhood. As far as I know, it can be hard to get a childcare license. What if we had a program that actually made it easier for people to set up these small types of businesses that are amazing jobs? It’s beneficial for everyone in my block. It’s beneficial for the kids to know each other. Imagine if we had those same types of incentives to steward wild lands. So we have an amazing national parks system in this country… I think it is one of the things that makes me most patriotic about being an American, is how much we’ve invested in preserving our wildlands. Imagine if we had more resources to do that at the community level. If you could start a community food garden. If you could be a steward of the land in other ways and actually earn money and have a job around that. I don’t think New Deal type policies need to be in existence forever. It’s really designed for periods of great change, when you need to retrain a large part of the population, or rehabilitate a large part of the population, get them back on their feet and working. I’m really excited about the ways in which both Samaschool and Samasource can be part of that dialogue. No one, as far as I know, has outlined what the Green New Deal could mean for international aid. I think we should also be thinking about how that same philosophy could apply to the billions of dollars we spend on foreign aid that are often not going at all towards fighting poverty. Denver: So good to hear somebody actually think and talk about the future, as we don’t get it much from our politicians. It’s all today and in the present, maybe tomorrow, no further than that. 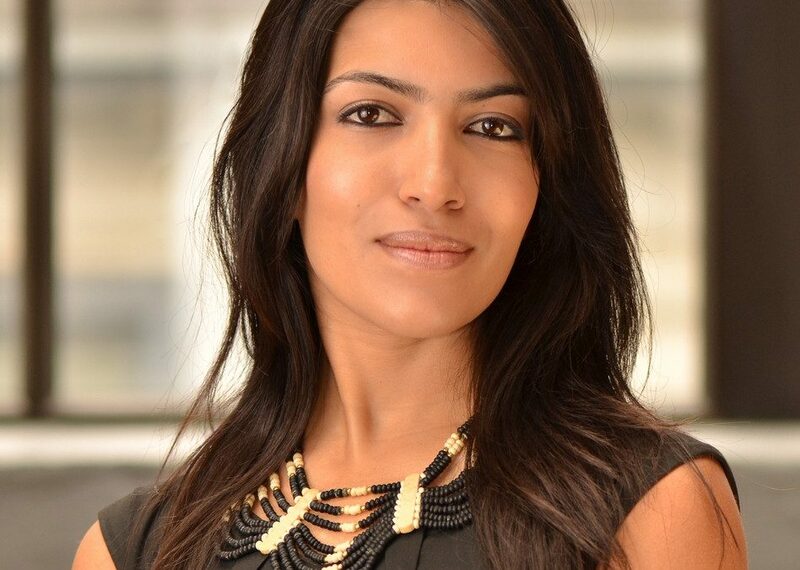 Leila Janah, the founder and CEO of Samasource and LXMI, I want to thank you so much for being here this evening. Where can people find out more about LXMI and all the little Samas? Leila: Samasource.org, Samaschool.org, and lxmi.com. Denver: Thanks, Leila. It was a real pleasure to have you on the show. Leila: Thanks, Denver. Great to be here. Denver: I’ll be back with more of The Business of Giving, right after this.